We Absolutely Believe in Quality Service "Discovering CRU KUSTOM WORKZ Quality Proven Home Repair Guarantee, it Safely provides Results You need in Home Improvement, General Maintenance, and Handyman Services" Our focus is to Simplify and Strengthen our growing Industry with Honesty and Purpose, while Achieving a Healthy Relationship with our Customer's. Please, while commenting have consideration for other. Fowl language will not be tolerated. 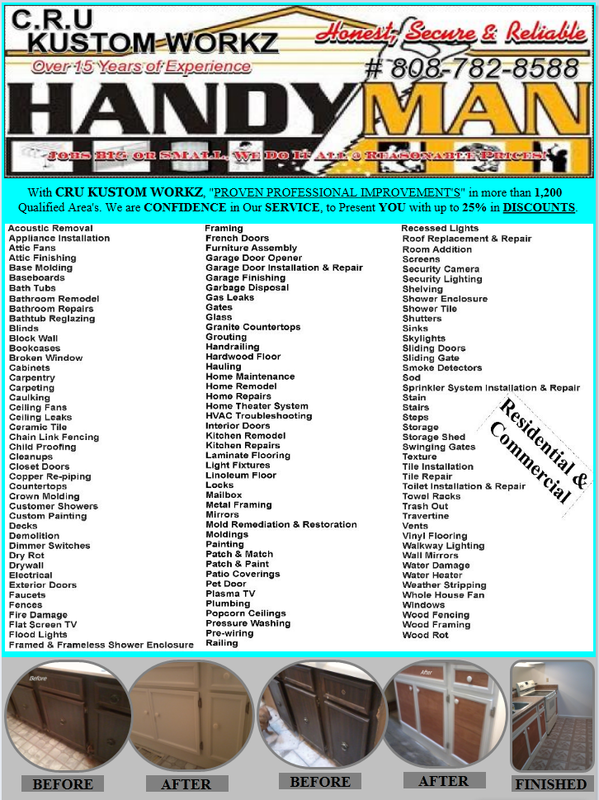 Our Professional Handyman Services Have Serviced Hawaii Since 1995. We have built a solid reputation in the community for our, outstanding attention to detail, superior customer service. Copyright (c) 2012. CRU KUSTOM WORKZ ®. Awesome Inc. theme. Theme images by NickS. Powered by Blogger.